CM Loadstar is the riggers choice for outdoor sporting events, concert tours, fesivals and theatre shows. 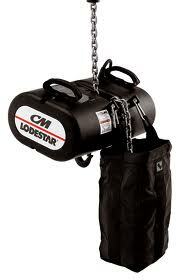 The legendary CM Lodestar is the tough motor that professional riggers around the world can rely on to get what they want, where they want it. Production Hire own a state of the art Loadstar 1000Kg LV Motor 26M for dry hire to support your live music event. Call or contact us for your free no obligation quote regarding Loadstar 1000Kg LV Motor 26M dry hire. One of the Production Hire team will be happy to help.